McDonald’s Canada has introduced heart-shapred RMHC cookies! 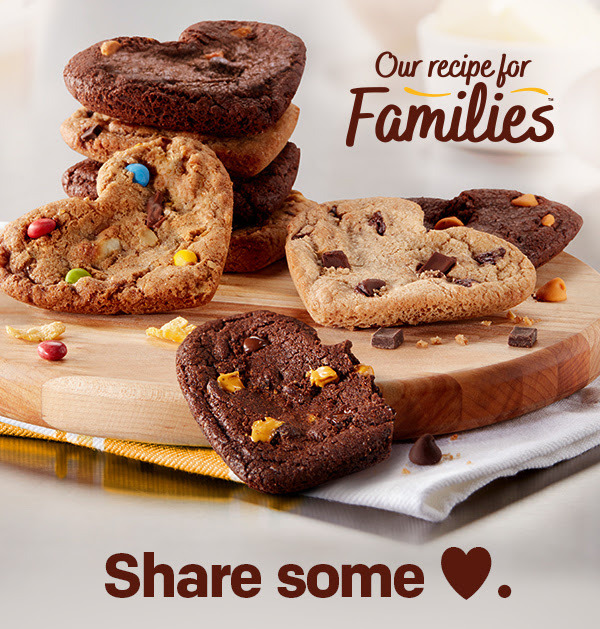 Every RMHC Cookie you buy helps families with sick children stay together at Ronald McDonald Houses and Ronald McDonald Family Rooms across Canada. RMHC Chocolate Chunk Cookie: A heartfelt take on a classic cookie. The RMHC Chocolate Chunk cookie is an instant favourite. With big chocolate chunks in a chewy cookie it’s a cookie you can’t help but love. RMHC Chocolate Caramel Cookie: A rich chocolate cookie sprinkled with caramel chips and semi-sweet chocolate chips. The RMHC Chocolate Caramel cookie is a new reason to fall in love with an afternoon snack break. RMHC L’il Gem Cookie: Baked fresh with colourful candy coated semi-sweet chocolate gems and milk and white chocolate chips, RMHC Lil’ Gem Cookies are a fun way to share your love. Click here to view all of McDonald’s Canada’s promotions.